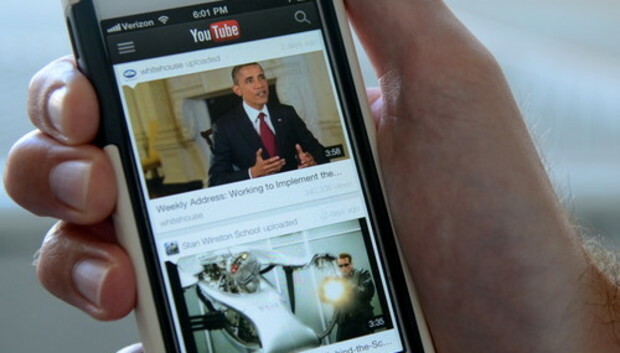 YouTube is adding some new video-playing functions to its mobile app on both iOS and Android devices. Some of the tools are aimed at giving users more control over how they stream video to their television sets using Chromecast, Google's new video streaming device. The changes are being rolled out officially starting Tuesday morning, Google-owned YouTube announced in a blog post. A smaller rollout among just a small percentage of users on Android took place on Monday, a YouTube spokesman said. Chief among the changes is a new tool letting users swipe to move a video to the bottom of the device's screen and reduce its size so they can search for other content while the video still plays. The idea behind the feature is to bring more potential videos to users as they explore within the app, even if the smaller video doesn't command their full attention. "You can watch a video about making the perfect fried chicken while searching for homemade salted caramel sauce recipes," said YouTube software engineers Matias Cudich and Waldemar Baraldi. The new version of the app includes several other enhancements to change how it displays video and interacts with other devices like Chromecast. The YouTube app already has a "Cast" button to let people send videos from their smartphone or tablet to their TV through Chromecast, Google TV or PlayStation 3 console. With the updated app, there is a preview screen users will see when the app is connected to their TV. With the preview, users will see a thumbnail of the video on their smartphone or tablet, allowing them to play it on their TV or add it to the queue, without changing the video that is already playing. Google unveiled its US$35 Chromecast device last month, as a cheaper alternative to competitive devices such as the Apple TV set-top box. Chromecast plugs into a television's HDMI port to let various types of video and music content be pushed to the television from users' smartphones, tablets or desktop computers. The new version of the YouTube app also lets users search and browse channels for playlists. Previously, users could not search or watch playlists within the YouTube mobile app, a spokesman said. Finally, the updated app features a cleaner, simpler look that will be seen in other apps from Google, YouTube said. The last time YouTube received considerable changes on mobile was last year, when the iPhone 5 and iPad version of the app got an enhanced look. Last year the Android version also received some speed improvements and an improved interface for channels. YouTube faces rising pressure to stay fresh and offer new features to users as the mobile video landscape expands. Twitter's Vine app and video on Instagram are two rivals both vying for attention from users. To give people another option, YouTube's founders recently launched MixBit, a service designed to let users shoot, edit and stitch videos together coming from multiple sources.